Despite all odds, I got one card made today. In the last couple of days I was invited to join The Pink Elephant community and Paperee community, my goodness there are so many people from all over the world to chat with and see all their special talents, very exciting. I'm posting my cards on those sites also and there they get a name, so tonight this card is Meditation Kitty. I haven't finished the inside yet, I want to find some kind of meditation quote, Kitty has a very peaceful look to me. 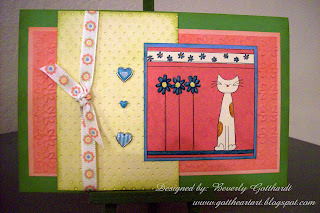 It turned out to be a very tactile card because I paper pieced the kitty and flowers and the strips at the top and bottom of the square. Even though my colors are off in the photo, that's really turquoise. Now that I'm looking at the card from afar, I wish I had matted the swiss dot rectangle. It turned out kind of cute, it just needed one little tweek, but I didn't want to unglue the ribbon. Supplies: Card Blank 8" X 51/4" from green card stock, My Mind's Eye Designer paper-MMEBK1, Cuttlebug cut & emboss folder-With Gratitude, embossing folder-Swiss Dots, Stamps: Stamps Happen,Inc.-60081 Flower Cat, Inks: Stampin Up-Kiwi Kiss, Whispers-Azure Seas, Color Box Soft Pastels Chalk Ink, CTMH marker-Sorbet, LePlume II-pale orange, peacock green, Making Memories-pebble brads, American Craft Elements-Cupcake ribbon. Very sweet!! Love that peaceful kitty image! Great little kittie! Cool card!!! Thanks for playing along with us! I love this little kitty! Thanks so much for using him (or is it her?) in our CTD! Kittie is so cute! Adorable card! Thanks so much for playing the CTD!